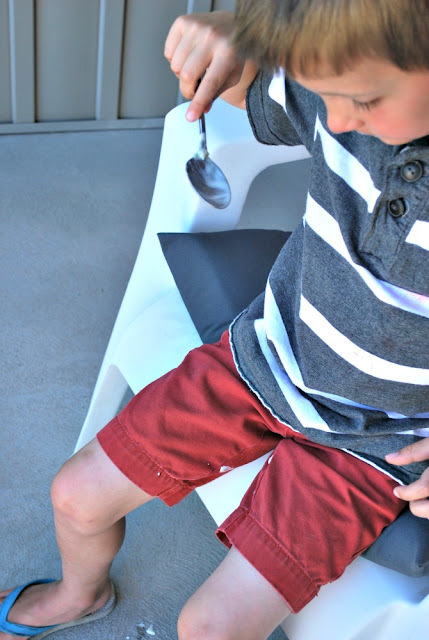 This flavor of frozen yogurt was our favorite of all the flavors during FROYO week. Of course that also means that it was gone the fastest. Um...yeah we ate all of it in two days, AND I am guessing the only reason that it wasn't gone the first night, is because I threatened everyone with utter doom if they did not leave enough for me to photograph. There were snickers and eye rolling from my family at the mere mention of food photography. Good thing that they love me so much. So I mentioned earlier how we all LOVED this frozen yogurt...it really was quite divine. Hubby liked it in its pure and un-fancied form. Just the limey goodness in all its glory. 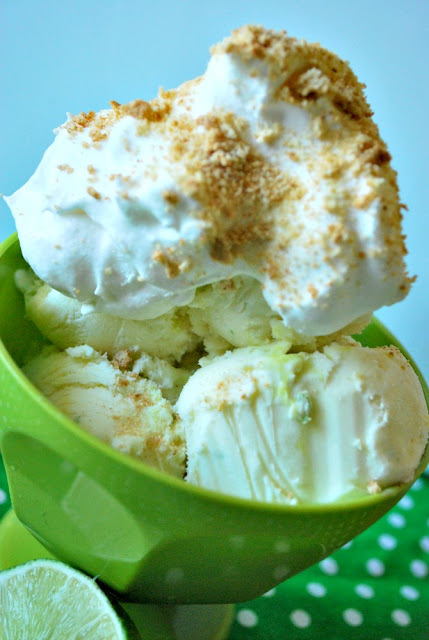 I liked it with a heaping dollop of whipped cream and a smattering of crushed graham crackers. I mean the flavor is Key Lime PIE. So it is only natural that you need a good amount of whuuupped cream and some graham cracker crust on top. This frozen yogurt is creamy and refreshing. The swirls of lime curd that ribbon its way through are little treasures of flavor. The curd swirls might be my favorite part. Making the lime curd will be a little time intensive, but it is worth it. PLUS it makes more than you need to so you can store it for another batch. OR you can just eat it right out of the jar. YUM. I am not going to lie, right now I am super sad that there is no more of this frozen yogurt in my house. A fact that will probably have to be remedied soon. The last bit that was saved for this very photo shoot was promptly eaten after all the pictures were taken. 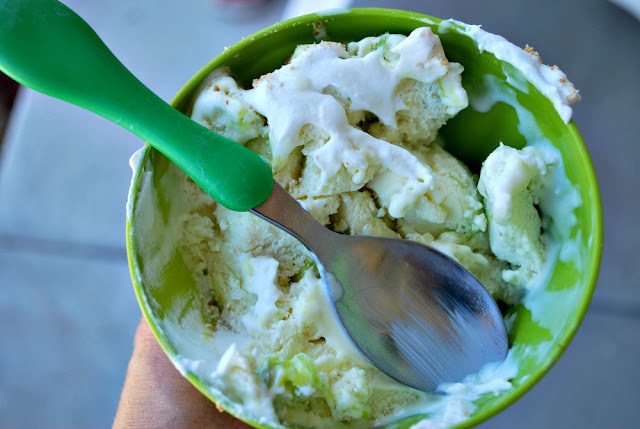 Middle and I quite enjoyed sharing this very last bowl of Key Lime Pie frozen yogurt. Do you think he has a big enough spoonful? Then to my horror, he dropped some. Can you just see me screaming "Noooooooo" and lunging for the precious scoop of froyo falling toward the ground? Don't worry I did not pull a Rachel and Chandler from Friends and eat it off the ground. I will just have to wait until I make more. Don't wait too long to make yourself some of this, just trust me on that. 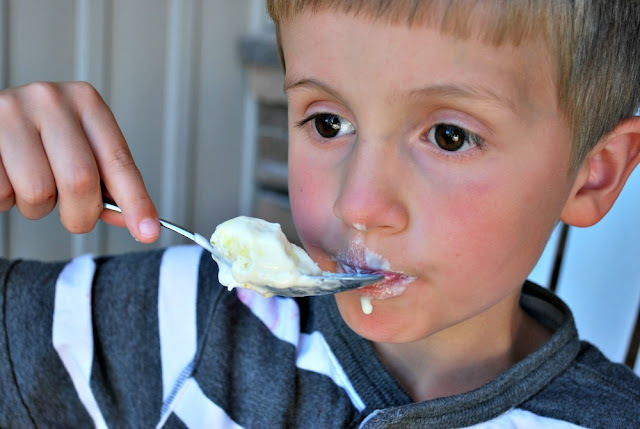 Beat the butter and the sugar in a bowl with an electric mixer. Slowly add the eggs and the egg yolks one at a time. Pour in lime juice and mix again. The mixture will look a little curdled. Cook the mixture in a saucepan over medium until it looks smooth. Increase the heat slightly and whisk continuously until it starts to thicken. Using a cooking thermometer, continue to cook until it reaches 170 degrees. Remove the curd from the heat. Let it cool slightly. Mix in several drops of green food coloring. You want the curd to be a lovely shade of lime green. Transfer the curd to a bowl and cover the curd with plastic wrap pressing it on the top to keep from the curd from getting a skin. Place in the refrigerator and let chill until ready to use. Whew, the hardest part is done. 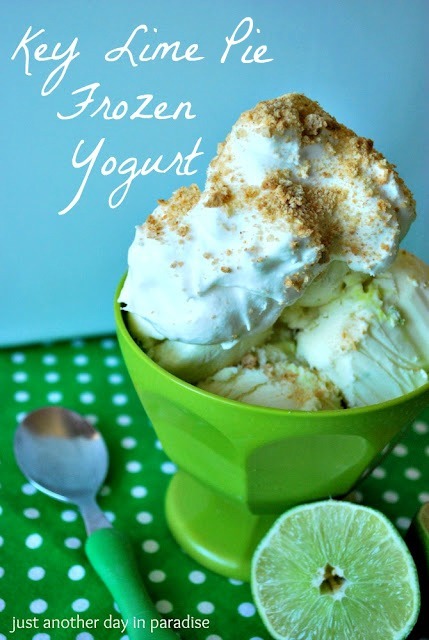 Combine the yogurt, sweetened condensed milk, lime zest, lime juice and 1/4 cup of lime curd. Blend well. Put into your ice cream maker. When done, remove to a freezer safe container. Dollop the other 1/4 cup of lime curd over the frozen yogurt and gently swirl in. Freeze until firm, about 1 hour. Serve plain or serve with some whip cream and crushed graham crackers. enjoy these yummy recipes as much as we did. I have LOVED FROYO week. Haven't tried any, but pinned them for later. 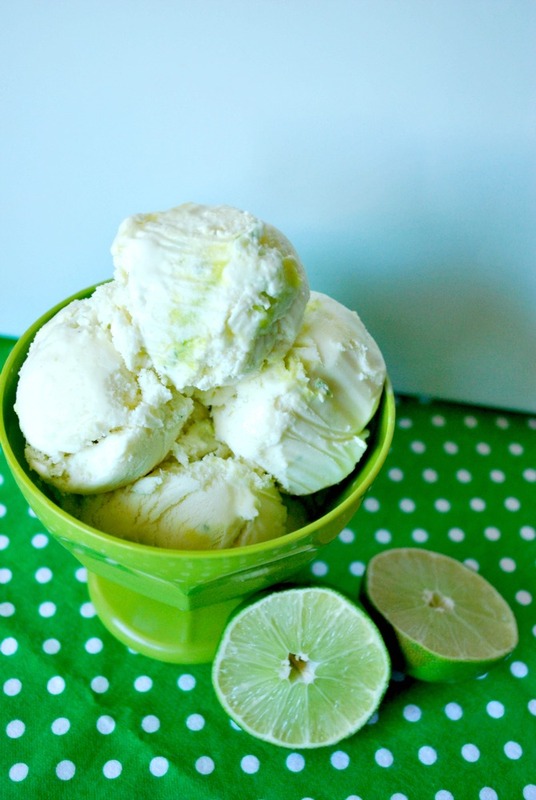 I esp love Key Lime! Can't wait to give them all a try :) Thx for the inspiration! Wow, this sounds amazingly scrumptious! I want some YESTERDAY!